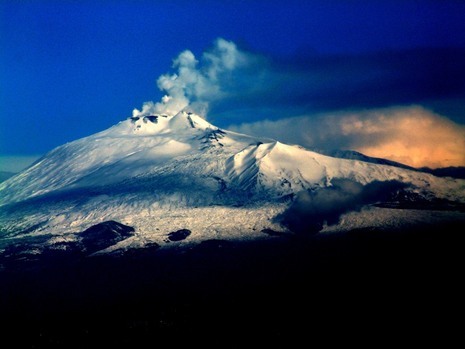 When Etna began to rumble and belch gas on March 8, the residents nearby ignored the warning signs of a larger eruption. Three days later, the volcano began spewing out noxious fumes in large quantities. Approximately 3,000 people living on the slopes of the mountain died from asphyxiation. Even worse, Etna was soon emitting tremendous amounts of ash and molten lava. The ash was sent out with such force that significant amounts came down in the southern part of mainland Italy, in some cases nearly 100 miles away. Lava also began pouring down the south side of the mountain heading toward the city of Catania, 18 miles to the south along the sea. 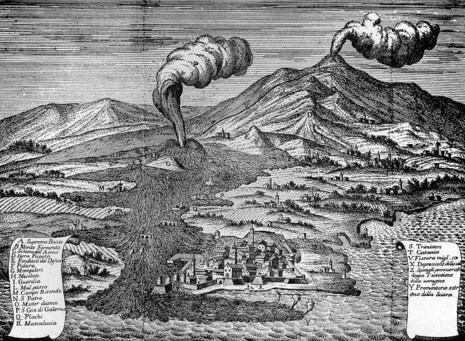 The most violent eruption in the history of Mount Etna occurred in March of 1669. On the first day, lava flows cut a smoldering gash out of two mountain villages. The volcano did not stop there, however. It continued to spew forth-molten rock for days on end, and by the end of April, the city walls of Catania had succumbed and the western side of the city was demolished before the lava mercifully came to a stop. The most dramatic explosion happened in 1669, when 20,000 people were killed by an unstoppable wave of lava. Fissures opened on the volcano's sides, sending the lava flowing to the city walls of Catania. The lava rose to the top of the wall and swept over, destroying much of the town as well as a dozen other villages. Villagers tried to divert the fiery flow by digging a trench above Catania, but they were unsuccessful.